The 11,000 year old, black beauties. Trader Joe’s Black Figs. They seem interesting, I like the name, but how do you eat them? It’s a question that betrays by ignorance as a novice fig eater. My childhood home had plenty of the mundane fruit – your apples, oranges and bananas, but the wider world of fascinating fruit was unknown to me until adulthood. Certainly not figs. Maybe that’s why I’m so fascinated by exotic plumcots and saturn peaches. Once you figure out what to do with these figs (just put them in your mouth and chew, it turns out), you’ll have to decide if you like sweet, meaty drupes or not. We’ll get to that in a second. The intriguing thing about fruit, for me, is that it’s always a very interesting food to interface with. Unlike, say, a hamburger, there’s always some sort of trick to eating a fruit, and every fruit’s trick is different. Whether it be natural or cultural, it seems there’s always a technique that makes the eating of any given fruit more fun/tasty/neat, the not knowing of which leaves you facing a messy, unpalatable or even inedible enigma. Of course, somewhere in the world someone knows exactly the best way to eat a persimmon. “Let it soften and use a spoon!” they’re yelling, just like someone knows the best way to peel a banana or how to slice a mango. Nature isn’t spending any money in the Market Research department, standing around and saying, “Yes, but will our target demographic like getting the coconuts open?” Unlike Target or Apple, Nature isn’t bothered by the user interface. It brings its product to market regardless, it’s up to us if we’re going to figure out how to use them. All of this fig eating ignorance on my part is very ridiculous considering that figs are possibly the first crop ever grown by man – with historical evidence tracing fig cultivation back to 9000 BC – about 11,000 years ago. The fact that we’re still munching on figs nowadays suggests that the fig must be a real crowd pleaser. The first thing you’ll notice when you get your Trader Joe’s fig is the yielding, fleshy texture of the fruit. This is an ordinary characteristic of ripe figs, but slightly off putting as well. Hold the fig by the stem and bite in – the taste is lusciously sweet, but also complex. The smooth skin, the meaty fruit and the crunchy seeds all combine for a fruit that is completely different from anything I’ve had before. 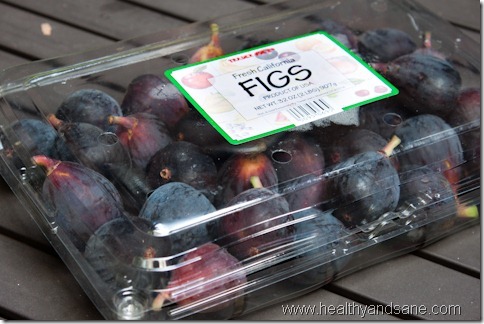 The inside of the fig is a bright, strawberry pink color, which contrasts beautifully with the purple-black exterior. I found I could enjoy a handful of these 2 or 3, but the sticky sweetness and the taste of high dietary fiber (like that of a ripe prune) warned me off of having any more. Overall, it was a good experience, but not one that I’d need to have daily or even weekly. 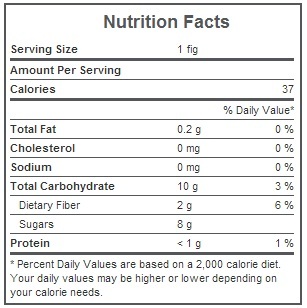 That said, there are a number of interesting ways to incorporate the figs into other foods or cuisines if you don’t necessarily warm up to them as snacks. Trader Joe’s might have the best suggestion themselves on their website – try cutting a fig in half, adding a few blue cheese crumbles and a touch of honey. Voila, the perfect hors d’oeuvre. Would I Recommend Them: Yes, this is an intriguing, tasty and different fruit. If you’ve never had a fig, you should go out and try these. Would I Buy Them Again: Probably not, except maybe to impress guests. Final Synopsis: Sweet and fleshy – interesting fruits to shake up your boring fruit bowl.